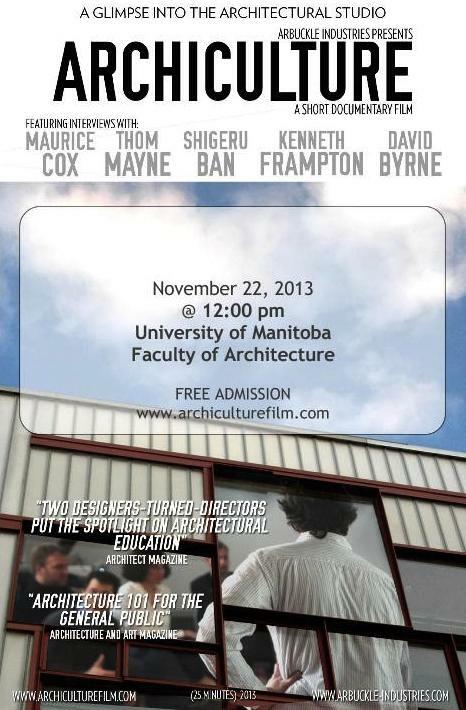 Archiculture is a documentary film that examines the strengths and perils of architectural education. The film follows a group of young design students through their final semester at Pratt Institute in New York City. The students interactions and reactions help illustrate the challenges of being a young aspiring designer in today’s world. The film weaves back and forth between the architectural studio and the architectural profession creating convincing impressions between students and industry leading professionals. The film brings the audience into the studio world with an authentic look at the friendships, culture and habits that result from peer-to-peer learning. From the dedicated all-nighters, to the ubiquitous coffee-runs, these students spend day and night together struggling through the same set of questions and problems. In what sometimes seems like cut-throat competition, the film illustrates the symbiotic benefits that arise in the shared studio environment. Another significant theme in the film focuses on the benefits and detriments associated with studio critique system. From one-on-one reviews, to public juried critiques, the film shows the ups and downs of these often intense interactions. The film also addresses the trend of training “star” architects and begs the question of how we should go about training the next generation of designers.